The U.S. Mint’s launch event for the Harpers Ferry National Historical Park Quarter will take place next Wednesday, June 8, at 10 a.m. ET. The ceremony is open to the public and will take place at Harpers Ferry National Historical Park in the Lower Town Historic District of Harpers Ferry, West Virginia, along the Shenandoah River. The event will include a coin exchange in which members of the public can trade cash for rolls of the new quarters. There is a one-roll ($10) minimum and 10-roll ($100) maximum in place for the coin exchange. Various officials from the park, the government, and the U.S. Mint will be there; a list of notable attendees is included below. On the evening prior to the launch (Tuesday, June 7), the Mint will host a Coin Forum at The Green in the Lower Town of Harpers Ferry National Historical Park. Taking place from 6:30 to 7:30 p.m., the event will give members of the public a chance to learn more about the U.S. Mint’s upcoming initiatives and weigh in on their ideas for future coinage. The reverse design for the Harpers Ferry National Historical Park quarter was created by Thomas Hipschen and engraved by Phebe Hemphill. It features an image of John Brown’s Fort, where Brown and his men faced their last stand during a raid on the Harpers Ferry Armory. Inscribed along the rim are HARPERS FERRY, WEST VIRGINIA, E PLURIBUS UNUM, and 2016. JOHN BROWN’S FORT is also included in the field below the building. 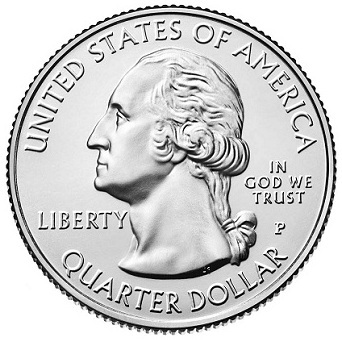 All America the Beautiful quarters share an obverse that includes John Flanagan’s 1932 portrait of George Washington, along with the inscriptions UNITED STATES OF AMERICA, LIBERTY, IN GOD WE TRUST, and QUARTER DOLLAR. Harpers Ferry National Historical Park was established on June 30, 1944 and includes land in West Virginia, Maryland, and Virginia. 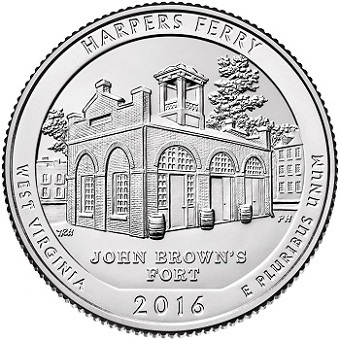 The Harpers Ferry Quarter will be the 33nd release in the Mint’s ATB series, which will conclude in 2021 following the issue of its 56th design. All five of this year’s quarter designs can be viewed here. Details from a U.S. Mint press release are provided below.